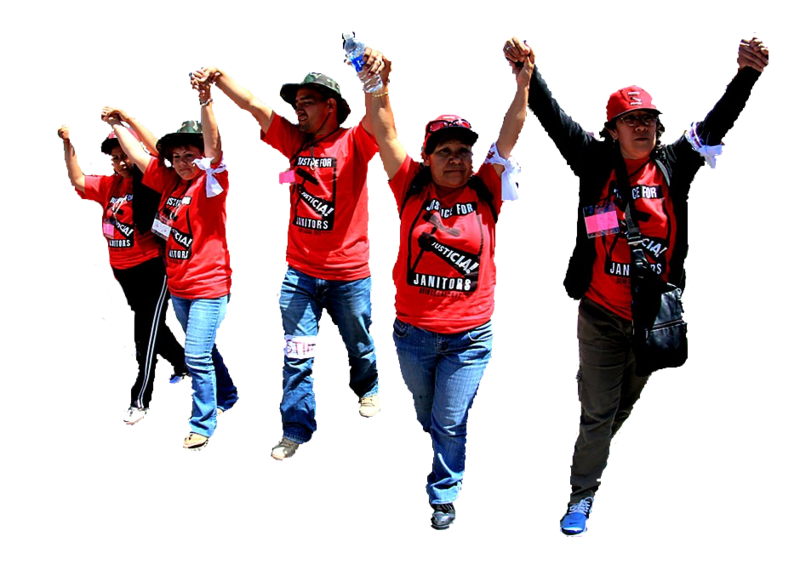 We are carrying on with crucial skill-shares, activist support, and training at the new House of Solidarity. In the past two decades, our workshops have demonstrated new tactics and better strategies to thousands of protectors. Your contribution makes this peaceful resistance possible. WildCoast is grassroots, eco-feminist, anti-racist, and fierce in defense of the land. We don't have fancy offices or high-paid staff, just a fighting spirit and the courage to win. Help supply our teams with equipment, food, and travel to the frontlines. 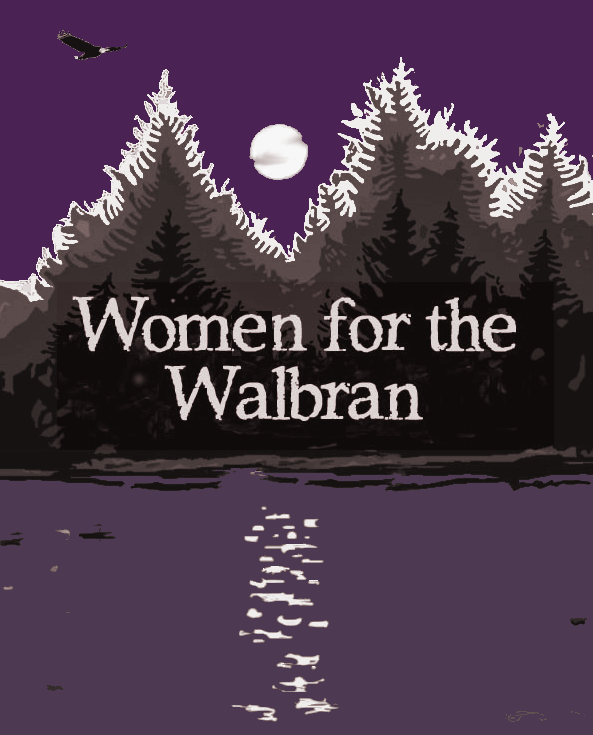 The court order blocking protests in the Walbran Valley EXPIRED in 2016. Activists across southern Vancouver Island are on guard to stop logging in the cathedral forests adjacent to the Carmanah-Walbran provincial park. 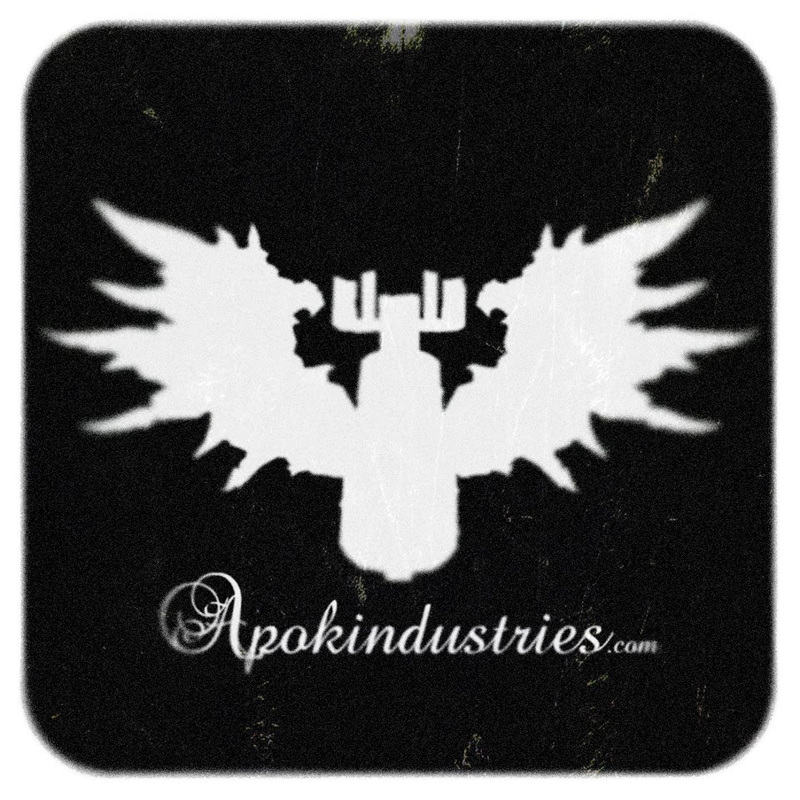 VIC FAN is standing by with legal support, a supply depot, and training to help keep the peace. Please get in touch to help. 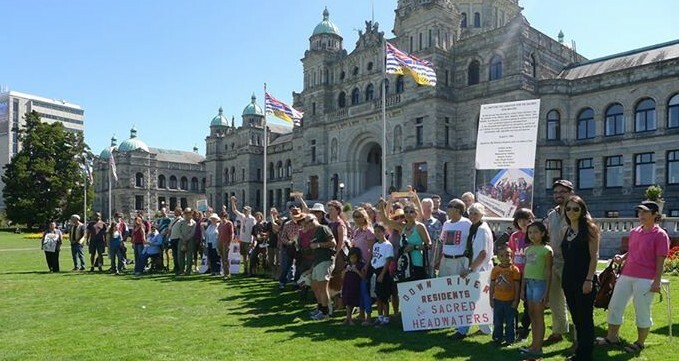 VICTORIA - Four years ago, Forest Action Network and indigenous activists announced the next phase of the grassroots movement against pipelines. 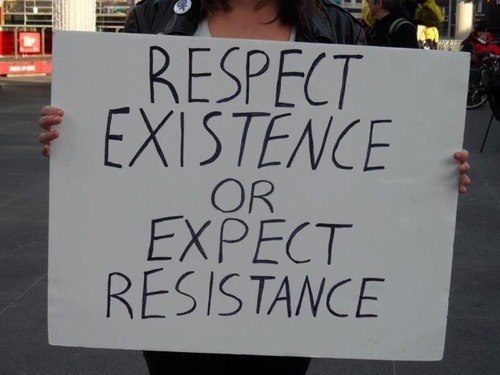 In the face of mounting threats to force pipelines across unceded indigenous territory to the coast, Forest Action Network and other local groups stepped up with concrete support for the resistance movement. Tankers, fracked gas terminals, pipelines, and tar sands have no place on the coast. We pledge to do whatever is necessary to keep them out. We are teaching non-violent protest strategies to everyone on the coast who's willing to learn. In the past two weeks, over 800 people attended civil disobedience workshops and solidarity trainings in Victoria and Vancouver to stop the pipelines. Email ac.tsaocdliw|eoz#ac.tsaocdliw|eoz to request a training session. We pledge to raise funds to defend anyone who risks arrest to stop the pipelines. Support the Eco Warriors Legal Trust. The province and the oil and gas industry are making plans to try and evict our friends at Unis'tot'en Camp, and we promise to come to their aid. We support all peaceful warriors. Investors and government should beware. We are driven by our love for the land and the coast. We won't stop, and we are determined to win. The Sacred Headwaters is the birthplace of Stikine, Nass, and Skeena, three of Northern BC’s major salmon-bearing rivers. Thousands of people from the northern interior to the coast depend on these watersheds for their livelihood and for the well-being of their families and communities. Now Fortune Minerals is actively test-drilling Klappan Mountain for an environmental assessment for a coal mine in the heart of the Sacred Headwaters. Join the frontlines against pipelines! (or help out behind the scenes). Info here. In northern BC, an indigenous community is thriving in the pipelines’ path. A permaculture garden, a solar-powered electric grid, a bunkhouse, elders’ trailers, campgrounds, a root cellar, a traditional Wet’suwet’en pithouse and a two-story healing center and counseling space have all been built with crowd-sourced funds and volunteer labor. Thank you to everyone who is a part of this community! Get involved with the Unis'to'ten volunteers. More info at UnistotenCamp.com. In July 2015, only a few days after the caravan left, the camp came under more pressure from pipeline companies trying to push into unceded indigenous territory. On July 19, the Unis'tot'en defenders evicted yet another pipeline crew from the territory. This time it was a two-person team that came in by helicopter. This was the third time the defenders have sent surveyors packing and warned them not to come back. It seems the higher-ups decided to ignore the warnings. We're getting ready to respond when there's a call for a day of action. It's a great opportunity to get with friends and build the resistance to pipelines and oil tankers. 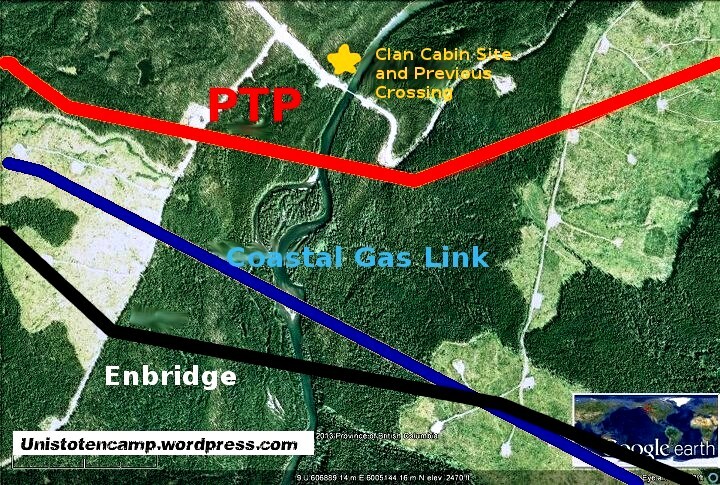 The latest pipeline proposal for the "Energy Corridor" between Prince George and Kitimat has shifted the route to pass south of Unis'tot'en Camp. Center: Wedzin Kwah (Morice River), the point where grassroots Wet'suwet'en people are making a stand to stop pipeline companies from entering their unceded territory. Top to bottom: Unis'tot'en Camp (star), Morice River West Forest Service Road (white line), fracking pipelines Pacific Trail (red) and Coastal Gas (blue); Enbridge Northern Gateway tar sands pipeline (black). indigenous activists are building a community two homes on the pipeline route on the bank of Wedzin Kwah. The first time a pipeline surveying crew tried to come onto the land was November 2012. 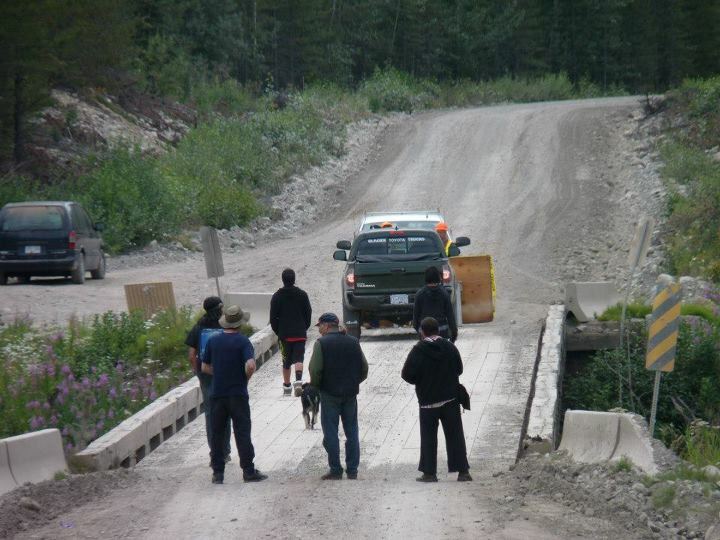 The crews were given trespass notices and escorted back across the bridge, off Unis'tot'en Clan land. Last year, 2.5 million lakes and waterways were protected in Canada. Today that total is 62 rivers and 93 lakes. The San Juan River is not one of them. The San Juan River is home to four salmon runs, ducks, geese, swans, otters, seals, and eagles. Goldstream River and its salmon runs are no longer protected. Cowichan River and its salmon runs are no longer protected. Cowichan Lake and its fish habitat are no longer protected. Chemainus River and its salmon runs are no longer protected. 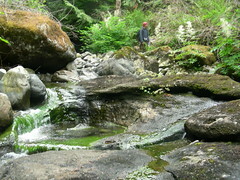 Sooke River and its salmon runs are no longer protected. In 2012, Prime Minister Stephen Harper's Omnibus Budget stripped away the rules that protected our rivers, lakes, and habitat for decades. 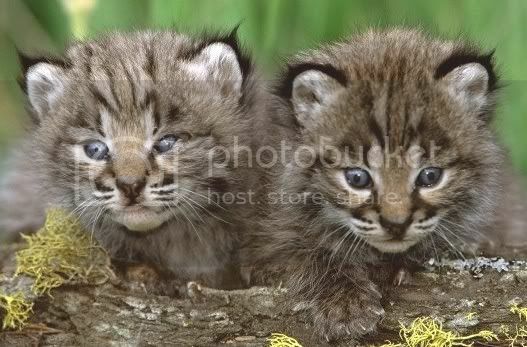 Now, entire ecosystems can be bulldozed, blasted, and paved over without consultation. That's just one reason why indigenous people are rising up across the country. Now is the time for all of us to defend the land, the water, the animals, and all living things. Stand with the defenders of the Wild Coast. Read the report on strategies and tactics. It was epic! Three days of public hearings, 250 speakers, and over 400 submissions — all but a few opposed. 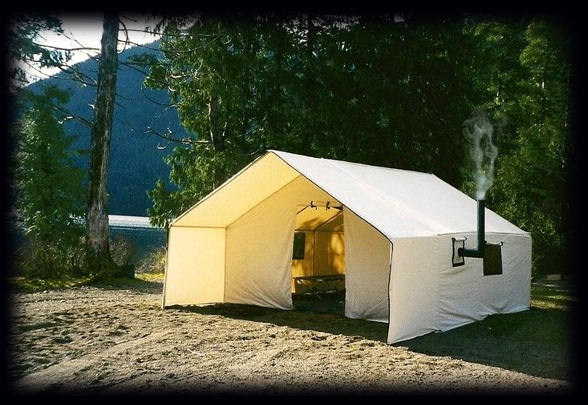 Testimonials came from Sooke, Jordan River, Otter Point, East Sooke, Port Renfrew, Pacheedaht First Nation, Metchosin, Shirley, Victoria, Langford, Saanich, Duncan, Cowichan, Vancouver, Ontario, even Israel and Belgium. 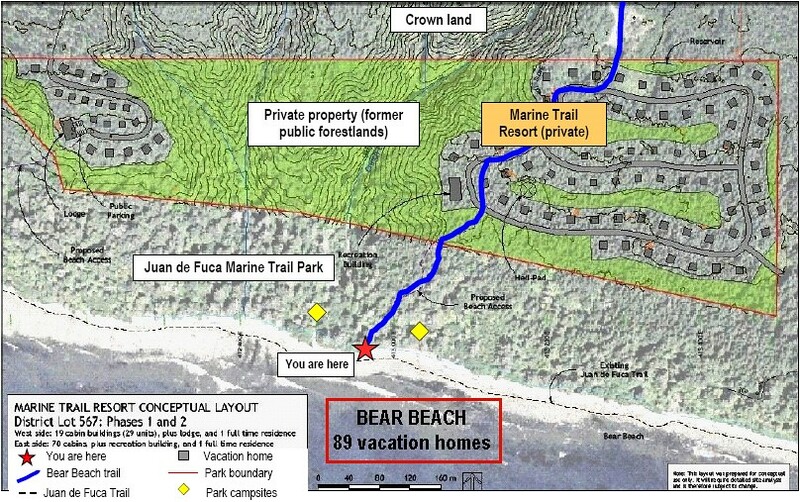 The following day, one after the other, three of the five committee members announced they were changing their votes to stop the vacation home development at Juan de Fuca Marine Trail Park. The vote on September 14 was unanimous. We won by shifting the balance toward the public interest. We won because hundreds of people came together to declare their commitment to protecting the forestlands. Politicians, newspapers, radio, and television heard you loud and clear. Congratulations! 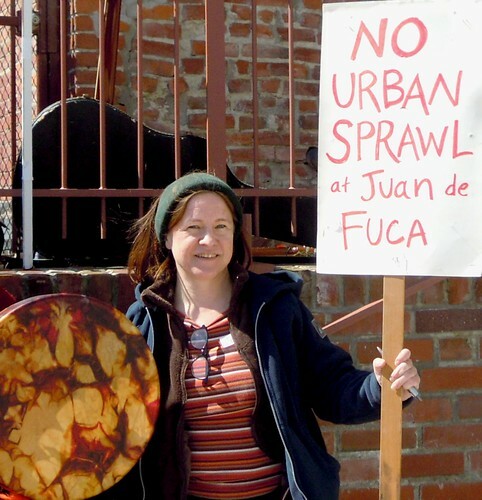 But the Juan de Fuca development proposal is only a symptom. The deeper problem lies with a small group of landowners who think they're entitled to profit at the expense of parks and livability. We defeated this proposal. But what about the next one, and the one after that? Going forward: Time to restore sanity and the public interest to land-use decisions. In July, regional decision-makers gave first approval to a huge development on the boundary of Juan de Fuca Marine Trail Park between China Beach and Sombrio Beach, 90 minutes west of Victoria. Land Use Committee A was on track to pass these bylaws and allow 257 private vacation homes, paved roads, septic fields, and even a helipad within meters of the park. Bear Beach (center), Juan de Fuca Marine Trail Park. This development concept shows 70 vacation homes on one side of the trail to the beach (blue line) and 19 on the other. Also shown: helipad, parking lot, rec centre, lodge, reservoir, and paved roads. Bear Beach is one of seven properties between China Beach and Sombrio that are planned for development. View more maps and photos on Flickr. 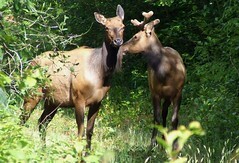 Each year, hundreds of thousands of people flock to Juan de Fuca Marine Trail Park to glimpse bears, elk, cougars, seals, sea lions, otters, mink, eagles, herons, orcas, and whales. 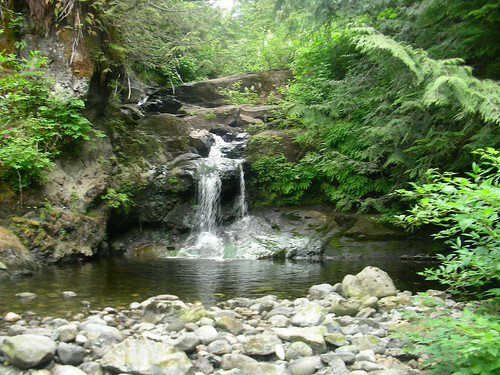 The 47-km wilderness trail starts an hour west of Victoria at China Beach, passes through Sombrio Beach and Loss Creek, and winds up at Botanical Beach in Port Renfrew. 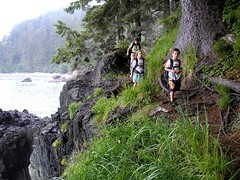 The 150-meter-wide coastal park features breathtaking scenery, amazing old-growth forests, and remote rocky beaches. All this is threatened by West Vancouver real-estate baron Ender Ilkay. Through his company, Marine Trail Holdings, he has applied to build 263 vacation homes, complete with septic fields, reservoirs, paved roads, and a helipad, on private land along the park boundary. Ten km of trail between China Beach and Sombrio Beach would be permanently damaged by erosion, clearcuts, human impact, and loss of wildlife. Worse, the developer is taking advantage of a loophole that gives full decision-making power to a five-member subcommittee of the Capital Regional District (CRD). Land Use Committee "A" has never seen a development proposal it didn’t like, and this one is no different. Indigenous environmentalists in the Pacheedaht First Nation are calling for a moratorium on development on their traditional territory until treaty claims are settled. Forest Action Network, Dogwood Initiative, the Wilderness Committee, Sierra Club, and Protect Our Parks Alliance have joined these elders to demand permanent solutions to destructive development. 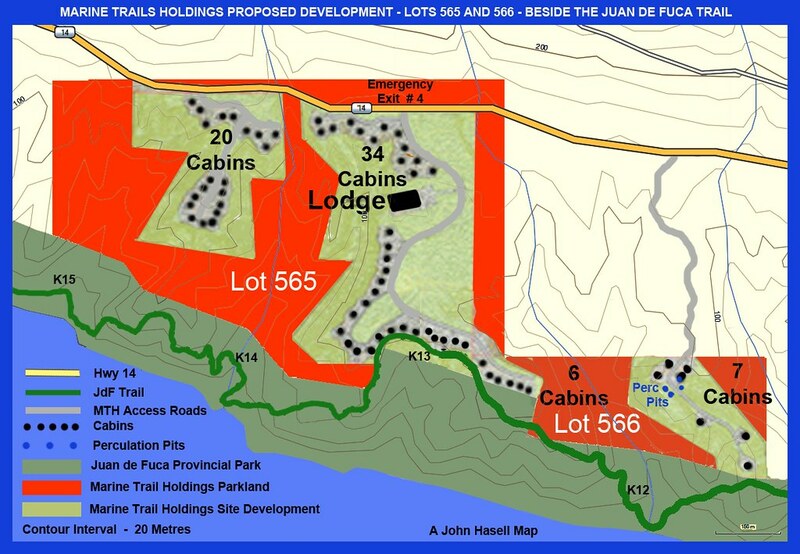 Did you hear the one about the tree-huggers who bought up the mining rights to the Juan de Fuca resort properties? That was us! Now no one can threaten to open a mine on the park boundary if the resort plan is rejected. Read the whole story at Vancouver Media Co-op. How does your local land-use committee make decisions? Land-use committees are supposed to listen to the public and make intelligent choices that uphold the community plan and benefit the whole region. But then there's the Juan de Fuca committee! Want to see what really happens in these meetings? Brace yourself. Warning! West Vancouver developer Ender Ilkay is planning a big new resort along Juan de Fuca Marine Trail Park. The latest version of the plan calls for 263 cabins, three lodges, paved roads, and septic fields on the steep Pacific slope. 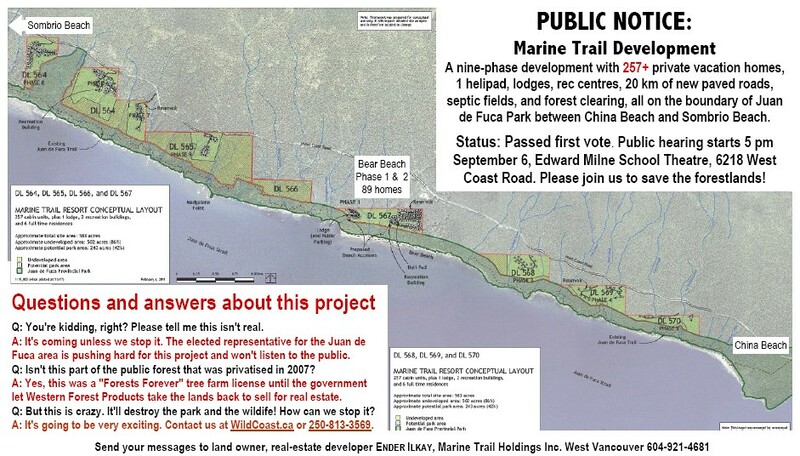 Over the next 12 years, blasting and bulldozing within meters of the park would damage up to 16 kilometers of the Juan de Fuca trail between China Beach and Sombrio. Ilkay wants to take advantage of a process that gives five people the power to make decisions about Juan de Fuca. The mayors of Langford, Colwood, Sooke, and Metchosin, plus regional director Mike Hicks, make up Land-Use Committee A. THANK YOU for telling the regional government what you think about sprawl in the Juan de Fuca forestlands of the Wild Coast. Director John Ranns, mayor of Metchosin, reports he received ONE THOUSAND emails and letters about the proposal. How many like the idea of hundreds of vacation homes on the park? "Three," Ranns says. Community groups are taking action to stop this proposal. Note: The developer has presented three different "development concepts" to the public at different times. This one from October 2010 shows two of the seven development properties adjacent to (and on top of) the Juan de Fuca trail. Another "development concept" supposedly leaves this parcel intact, but the developer still wants rezoning that would allow dozens of cabins on the existing trail. Shown: Juan de Fuca trail (green line), proposed roads (grey lines), proposed cabins (black dots), perc pits for future septic systems (blue dots). Juan de Fuca Marine Trail Park is dark green. Private property is red and light green. Click the map to view full-size. Click here for the whole set. Map: John Hasell. Please pass it on. Thank you! Forest Action Network, Dogwood Initiative, Wilderness Committee, Protect Our Parks, Sierra Club, Sea to Sea Greenbelt Society, Jordan River Community Association, and Jordan River Steering Committee have joined with students and local communities to make a super-group! 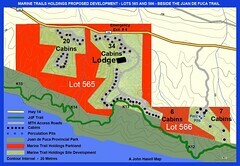 Our goal: save the Juan de Fuca Trail, stop urban sprawl, and restore sanity to land-use planning on the south Island. Students and community groups are working together for a new land-use vision on the south coast of Vancouver Island. The community mapping project focuses on the public's interest in preserving forestlands, rivers, and creeks. From Port Renfrew to Sooke and beyond, residents and visitors can witness the far-reaching effects of clearcut logging on the landscape, water, and wildlife. 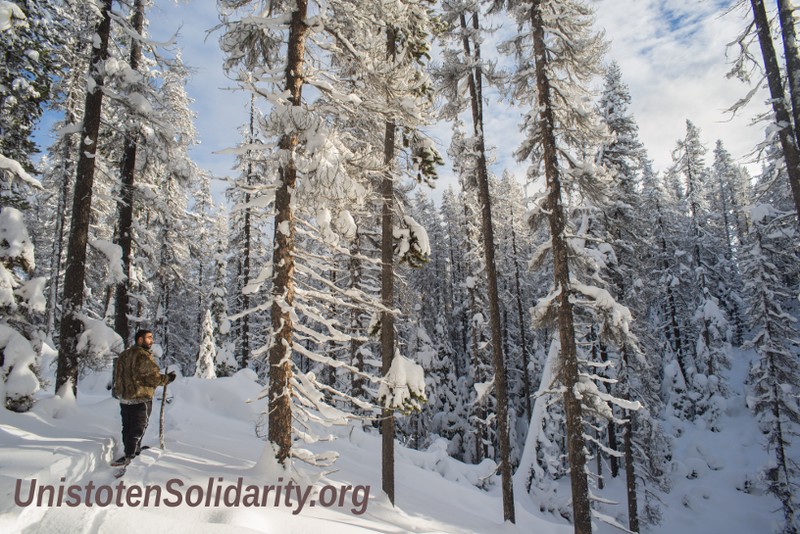 Support our work mapping old-growth groves and special places before it's too late. This work is carried out with the aid of a grant from the Freedonia Cooperation. Special thanks to Mountain Equipment Co-operative for its generous support of the Wild Coast Mapping Project. Go here to view the map. Go here to read more about the grove. July 14, 2010 - There's more than meets the eye in Avatar Grove. This strange forest of twisted giants near Port Renfrew, BC may be home to ecologically-sensitive karst (limestone formations) as well as huge gnarly trees. 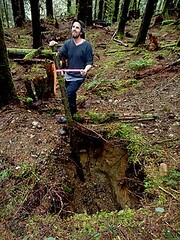 Researchers with Vancouver Island Community Forest Action Network (VIC FAN ) have documented landscape features that appear to be karst bluffs or outcrops and karst streams. "If our initial karst survey is confirmed, we have a compelling case for permanently protecting this grove," said Shayn McAskin, mapping coordinator for VIC FAN. The surprise discovery could halt plans to log the massive, gnarled trees on Crown land along the Gordon River two hours west of Victoria. "I expect we'll find the largest trees are growing on karst terrain, and they should be protected by the 2010 provincial order for karst," McAskin said. McAskin, a second-year environmental technology student at Camosun College, spotted limestone formations during a VIC FAN field trip to the grove in June. Subsequent research turned up evidence of karst potential from first-hand observation and in provincial geology maps. VIC FAN director Zoe Blunt said, "We have advised Teal Jones, the company that was planning to log the grove, about the consequences of damaging protected karst features. They have all the information we've gathered so far, and we'll be following up with more detailed reports as the surveys continue." 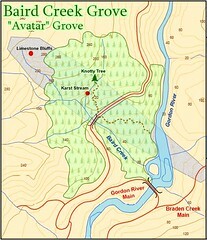 A resident of Langford, McAskin is the author and primary researcher for the Baird Creek/Avatar Grove map, released today by the Wild Coast Mapping Project and VIC FAN. Two dozen students and Island residents have contributed their time and energy to this grassroots project so far this year. The map initiative aims to cover the southwest coast of Vancouver Island from Sooke to Port Renfrew, relying largely on local knowledge and first-hand observation to highlight world-record-size trees, salmon and trout habitat, drinking watersheds, rare species, and recreation areas. Forest Action Network’s mapping project is carried out with the generous support of a community involvement grant from Mountain Equipment Co-op. 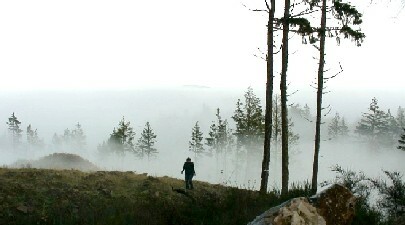 Ancient Forest Alliance campaigner TJ Watt first noted the Avatar Grove on a scouting expedition in December 2009. 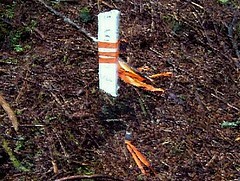 After discovering flagging tape for logging in February 2010, he began to raise public awareness about the endangered Grove. Ken Wu, founder of the Ancient Forest Alliance, named the grove after the Hollywood movie for its enormous and unusual trees. The towering forest is found on a steep, wet hillside about two hours west of Victoria, just inside the western boundary of the Capital Regional District and about 7 kilometers northwest of Port Renfrew on the Gordon River. As Crown land, it is part of Tree Farm License 46, and Teal Jones Logging of Surrey, BC owns the timber rights. 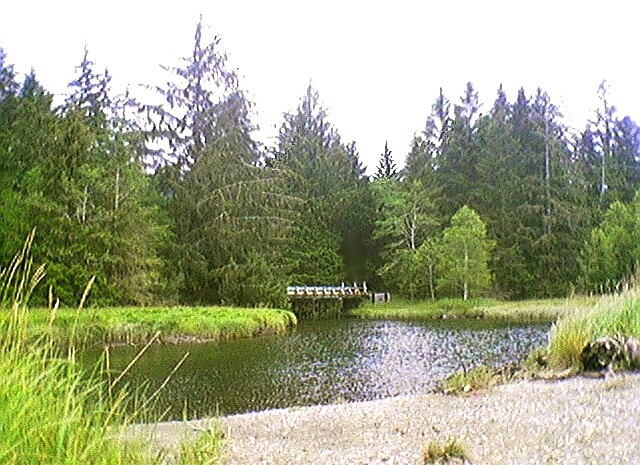 The grove is on the traditional territory of the Pacheedaht First Nation. Karst ecology is lush but fragile. Limestone rock dissolves in water, which can form underground watercourses and caves like the ones that were destroyed by the city of Langford and Bear Mountain Resort. In Vancouver Island's Tahsish Valley, a mature forest on karst was clearcut and burned, leaving a 'moonscape' of bleached white bedrock where nothing can grow due to soil erosion. 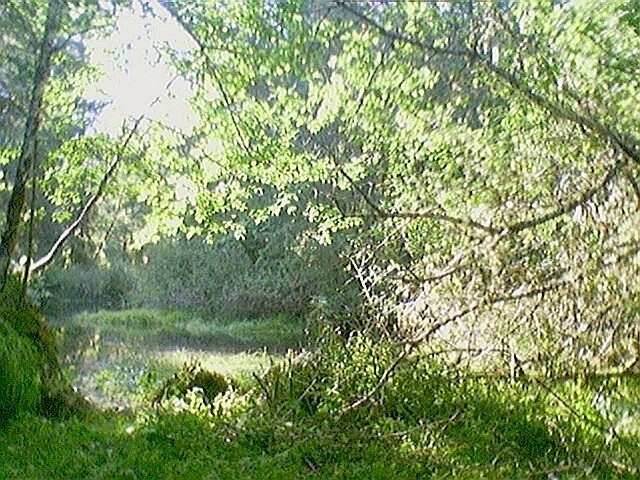 As of January 2010, the South Island Forest District classifies certain kinds of karst formations as environmental features that should not be damaged. "Results-based" forestry does not allow pre-emptive action to stop a company from implementing risky forestry plans. But the penalties faced by companies and professionals who engage in such damage, either willfully or out of ignorance, could be severe. As part of its campaign to save caves and rare species near Bear Mountain Resort and the unfinished Langford interchange, the Victoria-based non-profit petitioned the Supreme Court to overturn a Langford development bylaw for abuse of process earlier this year. A decision is still pending. 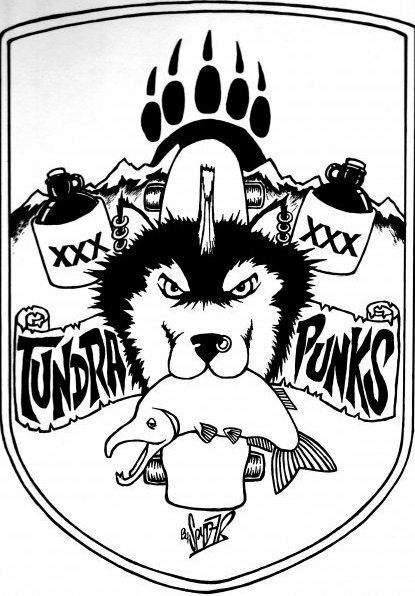 In summer 2008, VIC FAN published "The Langford Rebellion: Public Opinion, Development, and Bear Mountain," a 44-page analysis of the embattled resort and interchange project. Founded in 2007, VIC FAN is one of BC's smallest environmental groups, with about a dozen members, no paid staff, and no office. In March 2010, the BC Supreme Court heard our challenge to aggressive development in Langford. The proposed South Skirt Mountain development, like its neighbour Bear Mountain Resort, would destroy 5,000-year-old native heritage sites and untouched garry oak and arbutus ecosystems. Langford city council suppressed archeology assessments of the site, bullied and abused citizens at a public hearing, and refused to allow discussion about the unfunded "Bridge to Nowhere" - an integral part of the development. Two sacred caves have already been destroyed by Bear Mountain Resort and the Bear Mountain Interchange. 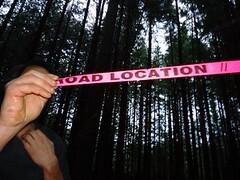 Vancouver Island Community Forest Action Network, a local non-profit environmental group, petitioned BC Supreme Court to quash the bylaw for due process violations. In 2009, Langford City Council approved the development re-zoning bylaw for South Skirt Mountain, located between the new interchange on Highway 1 and Bear Mountain Resort. Four landowners propose to build roads and condo towers with over 2800 units adjoining Goldstream Provincial Park to the west and Florence Lake to the east. North of the interchange, a half-built road (Bear Mountain Parkway) zig-zags up South Skirt Mountain to Bear Mountain Resort. In their haste to approve this development, we submit that Langford's mayor and council have acted in bad faith, ignored due process and disrespected procedural fairness. In addition, their application for a federal grant for the road and the interchange appears to violate the Community Charter, which prohibits municipalities from giving cash grants and other handouts to private companies. We suggest the best way to restore the public's trust in this council is for Mayor Young, Denise Blackwell, and Matthew Baldwin to resign immediately. The second option would be for all three to recuse themselves from Skirt Mountain-related files and ask an independent agency to open an investigation into this deeply-flawed process. We note that at least two of Young's businesses, Alpine Fence and Alpine Disposal, benefit directly from development at Bear Mountain. Young is also a member of Bear Mountain's $35,000 golf and country club, according to a document obtained by VIC FAN that appears to be the club's 2007 membership list. Read the list. Young's behaviour during the public process indicates to us that he is not capable of being open-minded or fair regarding development on Skirt Mountain. Blackwell says that a member of the Archaeology Branch instructed Langford Council to withhold the South Skirt Mountain Archaeological Impact Assessment from the public. This raises questions about how the decision was reached, and whether Langford is seeking to overturn an existing BC Appeals Court judgment. Previous Archaeological Impact Assessments and other reports concerning Skirt Mountain apparently have been withheld.from interested parties routinely for years. We have received several complaints about Baldwin behaving in an unprofessional manner toward those who may be critical of certain development projects, including reports that he is uncooperative, insulting, and obstructive to members of the public. In response to a letter that criticized the South Skirt development, Baldwin accused the letter-writer of "an utter lack of rigor for even the most basic research." He went on to characterize Zoe Blunt and others of spreading "fanciful misinformation." 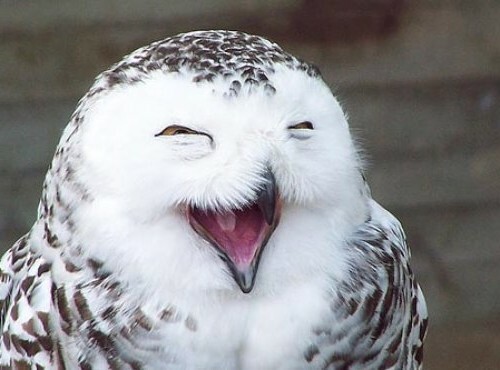 He then suggested Langford should take legal action against the letter writer. Baldwin then copied the letter, with its defamatory statements, to the writer's employers. Read the letter. VIC FAN is challenging a public hearing where Langford's mayor verbally abused residents opposed to the Bear Mountain Parkway and South Skirt Mountain Village development. 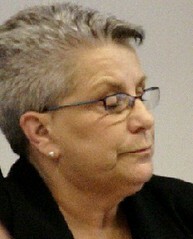 News reports from the hearing on February 23 show an angry Mayor Stew Young browbeating a retired schoolteacher, calling her remarks "negative" and telling her to "sit down." Other speakers were repeatedly interrupted and confronted by the mayor, who had earlier told reporters that he believes the development should be approved regardless of the public's objections. VIC FAN has also learned that the city and the developers have failed to consult with the Tsartlip First Nation, which claims SPAET (Skirt) Mountain as part of its traditional territory. For thousands of years, the mountain has been a shared site where families from the Esquimalt, Songhees, Tsartlip and other First Natons would gather for ceremonies and celebrations. Now VIC FAN is demanding a new public hearing on the South Skirt Mountain development. A February 27 letter to Mayor Stew Young and Langford City Council spells out several violations of the Local Government Act, and warns that if Langford adopts the controversial Skirt Mountain rezoning bylaw, it could be quashed by the Supreme Court. "We've put the City of Langford on notice that we won't tolerate berating, bullying and browbeating citizens who raise legitimate concerns about environmental destruction," said VIC FAN member Zoe Blunt. "These neighbours want to protect wildlife habitat and water quality for the enjoyment of the whole community, and the way they're treated at a formal hearing is absolutely appalling." - Audience members heckled and jeered at speakers. The letter continues: "Such conduct suggests that those charged with making the decision were not amenable to any persuasion, but rather went through the motions of holding a hearing with a totally closed mind." Provincial statutes and past Supreme Court cases set a clear standard for public hearings on land use, which are considered "quasi-judicial" and expected to maintain "courtroom-like decorum." The controversial South Skirt Mountain Village proposal includes 2800 housing units, a village centre and an ecological centre that will decimate the remaining native garry oak and arbutus ecosystems on the steep hillside east of Goldstream Provincial Park and south of Bear Mountain Resort. The west side of the development plan abuts the Florence Lake neighbourhood. Mayor Young revealed at Monday's meeting that the city is seeking federal and provincial infrastructure funding for the South Skirt plan, in addition to the Bear Mountain Parkway and the Spencer Road Interchange, which are already under construction. The interchange project and Bear Mountain Resort itself have been dogged by protests from environmentalists and First Nations people since November 2006. Two caves considered important cultural sites were destroyed during the construction of the interchange and the resort's second golf course last year. In February 2008, more than 60 RCMP officers raided a protest camp and arrested five people. Their charges were later dropped, and a Public Complaints Commission investigation is ongoing. Forest Land or Urban Sprawl? Who decides? We are walking along the bed of a stream older than any European settlement on this island. The water is clear and bright, I dip my cup in and feel perfectly refreshed. We are on the site of a proposed suburban development put forward by Western Forest Products near Jordan River. Although the project has yet to be approved work appears to be continuing here none the less. We reach some flagging tape marking the point where WFP wishes to put a residential street, one of many that will crisscross this stream. The CRD has passed a bylaw that prevents the subdivision of this land into small parcels specifically to prevent this type of development, however Oak Bay-Gordon Head MLA Ida Chong sat on it just long enough for WFP to get their land use application in. They have therefore saved themselves from these conditions through a grandfather clause. VIC FAN volunteers have joined the broad coalition of First Nations, environmental, community, recreational and business groups that have been working to stop the subdivision of thousands of hectares of forest in the Juan de Fuca forestlands. VIC FAN's work in the field enhances and supports the work being done to protect these forests by surveying the lands on the ground, identifying species and risk and compiling scientific data and public testimonials. VIC FAN volunteers make regular excursions in and around the proposed subdivision lands to assess the progress of work being done and to document the impacts on the land. Our goals are to provide logistical support and information to those opposing development in the area and to build a picture of the forest ecology in this region, to create a sense of connection to this land and share with others the joy of learning about the natural world around us. 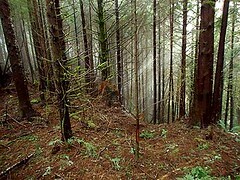 If you share a connection to and love of this forest land, know of sensitive areas you'd like to see surveyed and assessed, or just want to share your thoughts, opinions and feelings about this area, please send us an email at moc.liamg|noitcatserof#moc.liamg|noitcatserof, or participate in our online discussion forum. VIC FAN's work is driven by the needs and demands of the people most closely connected to the land. Your advice, opinions and suggestions determine where we conduct our research. Please consider supporting the work we do with a donation. At this time we are completely volunteer driven, and funds for the program go towards outfitting our field camps and excursions and transporting volunteers into the field. We would also like to be able to provide compensation to scientists, First Nations elders and other local experts who take time to join us on these expeditions and help us with our work. 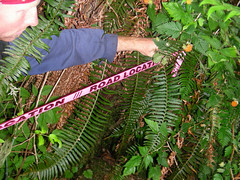 Volunteers are also welcome to join us, regardless of your level of ecological knowledge. A love of the land is essential.